A war left unfinished... until now. "Unfortunately, war tends to distort our point of view. If we sacrifice our code, even for victory, we may lose that which is most important: our honor." Star Wars: The Clone Wars is a 3D CGI animated installment set in the Star Wars franchise. It is created and executive produced by George Lucas and directed by Dave Filoni (Avatar: The Last Airbender). The Clone Wars presents the self-titled galactic war between the Galactic Republic and the Confederacy of Independent Systemsnote also known as the Separatist Alliance or Separatists that began in Attack of the Clones, where the Jedi Order serve as the generals of the Republic's Clone Army. The Clone Wars primarily focuses on Obi-Wan Kenobi (James Arnold Taylor), Anakin Skywalker (Matt Lanter), and Ahsoka Tano (Ashley Eckstein) as they deal with the various adventures and battles fought in the war alongside the Clone Troopers (Dee Bradley Baker), other Jedi, and politicians up until Revenge of the Sith. 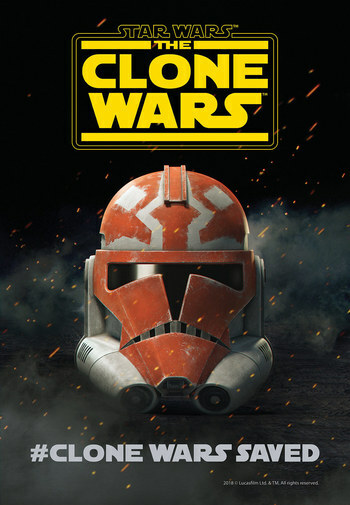 The Clone Wars began with a Pilot Movie distributed by Warner Bros. Pictures on August 15, 2008 and aired for five seasons on Cartoon Network. The installment was in production of a sixth season, but was cancelled shortly after the season five finale in 2013 following Disney's acquisition of Lucasfilm. The episodes of the installment that were in production were released as a Netflix exclusive while its unproduced story arcs were adapted into other mediums. In 2018, The Clone Wars was Un-Cancelled, with the announcement that twelve episodes will be animated and released on Disney+. The Clone Wars is the final installment created and executive produced by George Lucas prior to selling the franchise to Disney. As a result of being created by George Lucas, The Clone Wars is the only Star Wars installment outside of the six theatrical Star Wars films to be canon following the Continuity Reboot. Darth Maul: Son of Dathomir: a comic book adaptation of a a four-episode story arc that presents the aftermath of the Shadow Collective arc. Dark Disciple: a novelization adaptation of an eight-episode story arc where an unlikely duo joins forces to assassinate Count Dooku. The Clone Wars was followed in production order by Star Wars Rebels prior to its renewal for a seventh season. Preview: SDCC 18 trailer . Please move any character tropes to the proper character page and tropes associated with specific episodes and story arcs to the recap page. "This is a war. If we aren't willing to do what it takes to win, we risk losing everything we try to protect."